The number of mergers and acquisitions in the global marketing communications space increased by 13% last quarter, led by 12 deals involving WPP. According to new data from Results International, there were 246 transactions between April and June, compared with 218 in the first quarter and 199 in the same period in 2014. WPP’s activity included the acquisition of Medialets, the US-based mobile specialist, and the full-service agency RSK Group in Germany. Dentsu Aegis Network completed ten deals in the second quarter, including the acquisition of eCommera, the e-commerce specialist that became part of Isobar in the UK, and the content business John Brown Media. Dentsu Aegis Network was the most prolific buyer over the first six months of the year, striking 19 deals. This represents about 4% of the global market. Publicis Groupe and Havas were the third and fourth most active marcoms buyers in the second quarter. Havas’ acqui­sitions during the period included Just Health Communications in the UK. North America remained the most active region for ad-tech deals, with 51% of the quarter’s total. However, transactions in Asia-Pacific were up by double digits to 16%, while Western Europe’s share rose from 13% to 18%. 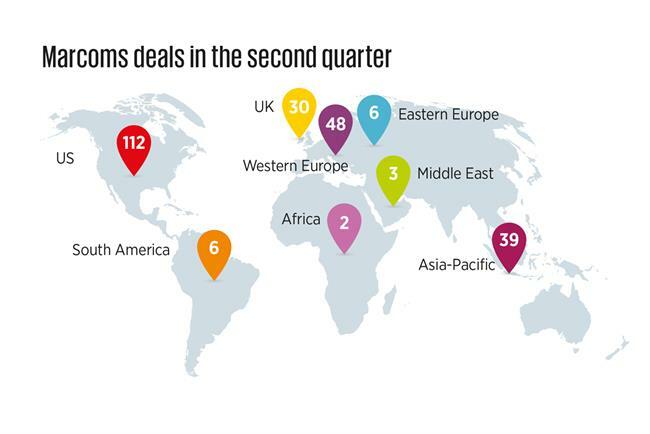 Julia Crawley-Boevey, a director at Results International, said: "Although April to June was a relatively light quarter in terms of disclosed deal values, the significant increase in volume compared with both Q1 2015 and Q2 2014 suggests that buyer interest in good marcoms businesses continues to snowball."